Battle For Pooh - The long, ongoing fight between the Slesinger family and the Walt Disney Company over the rights to the billions-of-dollars-generating characters. Convergence - This is a term used only recently to describe a coming together of information, technology and the ability to have action to create a change. Basically, it's the power of the new media(read: blogs, YouTube, cable and other sources) to influence and educate people... in our case, Disney Geeks/Fans. Creative, A - The ones within the Walt Disney Company that believe in creativity. Art is the highest achievement. The creation of something noble, something entertaining that captivates the observer. These would be the Imagineers, the directors, writers and other storytellers with in the company. Eeyore, A - A person that is exceedingly, unnecessarily negative. Even if there heart is pure, they forecast doom and gloom without noticing it. Forgotten Mouse Tales - Movie projects that were under development at Walt Disney Studios that were never made for a variety of reasons. Fun Factories - An endearing term used as a nick-name for Walt Disney Parks across the world. Glendale Kingdom, The - Blue Sky Disney's description of the business complex in Glendale that houses Walt Disney Imagineering, DIsney Toons and Walt Disney Animation Studios(Walt Disney Television Animation is located on the studio lot in Burbank). Golden Age, First - This is the time usually referred to the period from "Snow White and the Seven Dwarfs" through Bambi and basically includes the first five Disney films: Snow White, Pinocchio, Fantasia, Dumbo and Bambi. Golden Age, Second - This is the time usually refereed to the period from "The Little Mermaid" through "The Lion King" and from Blue Sky's view actually includes these DIsney films: The Great Mouse Detective, The Little Mermaid, Beauty and the Beast, Aladdin and The Lion King. Lamp, The - Slang for Pixar Animation Studios. Mouse, The - Slang for the Walt Disney Company. Mouse Traps - Originally a description of the new off-site properties and entertainment centers that Jay Rasulo has planned for the company. Usually used to refer to projects/attractions that Disney planned on building to seperate guests and their cash. Nerdvana - Slang used to describe the San Diego Comic Con. If you've ever been there... you know why we use it. Old Maestro, The - Not a term we came up with, but one used periodically here at BSD. It was a nick-name given to Walt referring to his ability to grasp creative talent and play it like a symphony. Owl, A - Someone who bloviates on and on about a subject... hey, whatayoulooking at? Pooh, A - Someone who is exceedingly, unrepentantly positive. A person who always sees the bright spots and is contagiously optimistic without noticing it. Rabbit, A - Someone that is a pragmatist. One who goes about their belief that good can happening, but preparing for the worst and expecting it. Suit, A - These are the people whose main concern is the bottom line. The essential part of the company where cost is all that matters. Everything has to be looked at through the prism of how it affects the bottom line. You've heard the term "Money is God"... well, these are the true believers. Uncle John - Our endearing term for John Lasseter... a homage to the dear founder of our obsession, your host... Walt Disney. 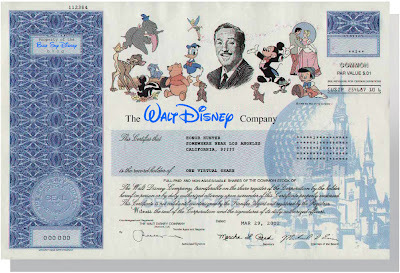 Virtual Shareholder - A term used to describe the internet community of Disney Geeks/Fans that use their keyboards to display love and affection or hatred and venom toward the actions of the Walt Disney Company and its Executives. Really cool list, but not to be to geekish, I think the Bothans were mentioned in Star Wars IV, A New Hope. First, Bothans ARE from Return of the Jedi. Second, weren't there animated films between the first golden age and the second? Would those be the "silver age"? I looked in the mirror, though, and all I saw was me! Sometimes we do forget that not everyone's heads are filled with Disney stuff. Yer such a Geek, George... Finished Halo 3 yet? None that fit a family friendly site, I guess. If "The Mouse" is an acronym, what do the letters stand for? Yes. My son and I finished it Wednesday evening. Whew. Now we are starting on the harder level!